For vehicular access to take-off, take the A467 from Newport or Brynmawr. Then take the B4591 to Crosskeys. Turn right at the first set of traffic lights, then second left into Cobden St. Continue along this street until you reach the sports fields, then turn right into Blackvein Rd. Follow this narrow road up the steep hill and over the cattle grid. Half a mile later, turn left through the gate and follow the track to take- off. If the gate is locked please contact Mr Sutor at the adjacent farm (F). For foot access to take-off follow the A468 from Newport or Caerphilly and minor roads from Lower Machen. For foot access use the large viewpoint car park. For vehicular access park at the side of the track to take-off, just before the transmitter mast – either on the bend or just after it. Do not obstruct the track or drive onto the common. The track may be quite rutted and bumpy. Access is a long hard carry on foot from the viewpoint car park or a short carry over rough ground from the parking area by the transmitter. The south and south-east take-off is now dangerous to take off from – due to the trees out in front. The trees are gradually being removed from the hill. When the trees have been cleared in front of the south and south-east take-off the situation will be reviewed. Until then you are advised not to fly in any wind direction with tall trees up wind of take-off due to the turbulence they create and the glide required to clear them. The steep NE take-off is little flown by hang gliders, and more suited to paragliders. The SE take-off looking towards the quarry. Note the tall trees which will give off significant turbulence in increasing wind speeds. Top land on the flat ground alongside the transmitter mast (A). There is no bottom landing on the NE side, but shoulder landings are possible by the viewpoint car park at (B). 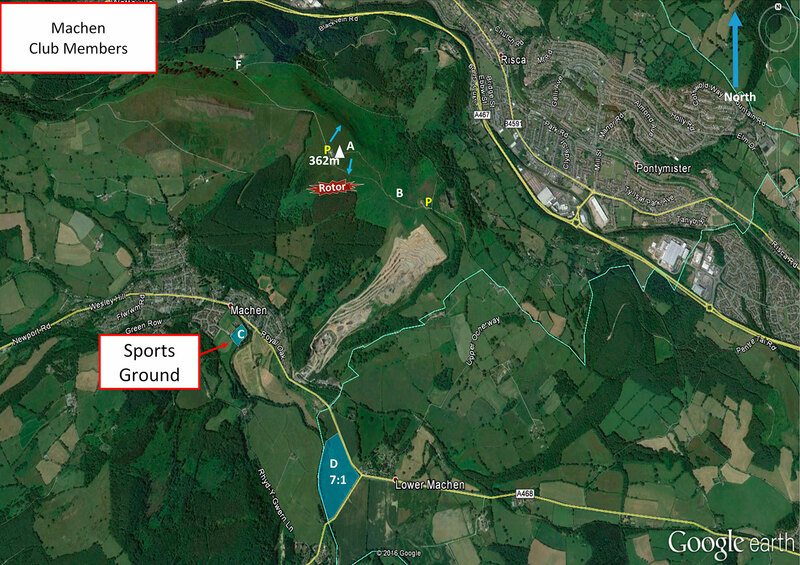 When/if the South face becomes flyable again, bottom landings are possible at Machen sports field (C). This has a difficult approach over a housing estate. Watch out for trees, floodlights, rugby posts and overhead cables to the South of the field. Don’t land on the field if a match is in progress. There is also a large field (D) to the SW of take-off, but this requires a long glide over the quarry. Don’t use this field if it is in crop. Neither field can be seen from take-off, so pilots are advised to visit both fields before flying to check their suitability on the day. Shoulder landings at (B) may also be possible. Don’t land in any other fields and stay clear of horses as they can be spooked easily. 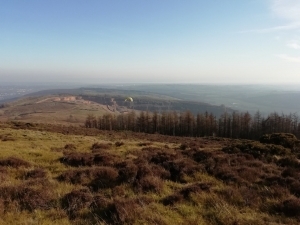 The top take-off of Mynydd Machen. This site can be very turbulent in strong winds, and is best flown in lighter winds. A view of the south and south east side of Mynydd Machen. You can see the distinctive aerial mast on the right of the image. The trees are gradually being removed so that the take-off on the south will be clear again. Trees on the south and south-east sides. Rotor on north-east take-off has also been experience. Avoid the large aerials and buildings on top of the hill. 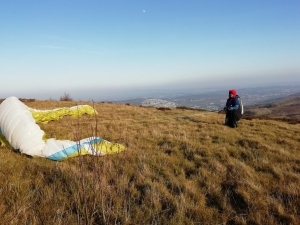 Model aircraft pilots have been known to use the hill – be considerate of them. Horses are found in many of the fields – avoid landing in or flying low over these fields. This site is rarely if ever used for XC. 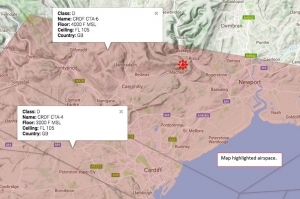 The site sits within a 4000 ft airspace limit. Mynydd Machen Mountain 2km South of Crosskeys village near to the A467.